Animal and human healthcare medicine are closely linked, in this blog we hear how the researchers at Epipole have learnt first-hand how overcoming technical challenges to re-purpose their specialised equipment for veterinary medicine, has led to improving their technology for Human medicine … so with each contributing to the other, where else can we adapt to improve both animal and human healthcare? At Epipole we began our medical device journey back in 2011 with the aim of helping clinicians around the world to find blinding pathologies and thus to save sight. Save sight in humans, that is. Working in this area over those years, we came to recognise that animals were quite poorly served in this respect. 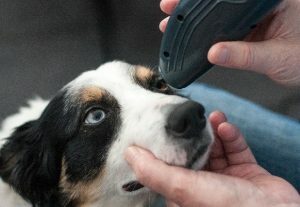 Their eyes were in the care of a small number of highly qualified and dedicated referral vets whose expertise was immense and whose equipment was highly specialised. What we needed to do was build a device that could be used by all vets in practice and thus widen the diagnostic use of ophthalmology. Having already built and proven the efficacy of two hand-held, low-cost, fundus cameras for human eyes we decided that we would take up the challenge of building a device for animals and see where that led us. 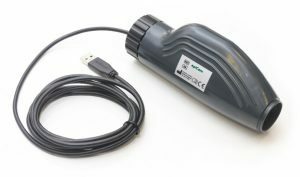 Although epiCam M and epiCam C were designed to image the human eye at very high resolution – they can resolve detail as small as 10 microns – we knew that they were also “general purpose” enough that their core imaging technology could be re-purposed for veterinary applications. The major challenge was that whilst humans have a fairly predictable physiology, the label “animal” applies to a massively varied population. Firstly, the simple geometry of the orbit of various eyes can vary in size by centimetres, from the guinea pig to the giraffe. And then there is the variation not only in pupil size but shape, from the bizarre multi-stage penguin pupil to the massive horse pupil – real levels of complexity. Moving on to the retina itself, there we also find an enormous range of shapes, sizes, structures, textures and what I can only describe as odd bits. Some bits are missing, in different places or at locations that seem to defy explanation. All of this has to be imaged and the device still has to turn out diagnostic levels of quality. However, we always knew that we would end up with a much more complex device for animals than for humans. 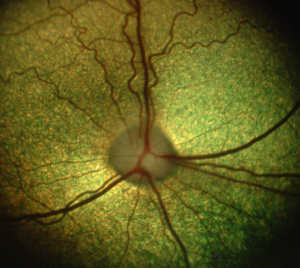 At its heart, a fundus camera is a microscope with on-axis illumination and a sensor in the place of the human eye. Much of our microscopy imaging technology was already complete and well tested, there was just the vexed question of illumination delivery and image formation to sort out. As part of this, rather inconveniently, some animals have a tapetum lucidum that will massively over-expose a sensor even under low illumination. This, and the other issues, has meant that we had to give the device several more controls than we would need for humans – digital illumination control being just one of them. Ironically, some of the technical challenges we had to overcome have meant that improvements and features have made their way back into the human imaging devices and for that we are immensely grateful. Neonate humans and small dogs turn out to be not that dissimilar after all. 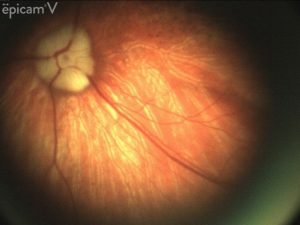 Where next for digital veterinary ophthalmology? We are working hard to bring it to a wider audience, make it part of standard veterinary practice and provide an enhanced insight into pet health. 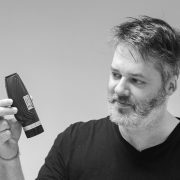 Dr Craig Robertson (pictured) is the founder of Epipole Ltd., an award-winning medical device company developing high quality, inexpensive video fundus cameras. Craig’s early background was as a researcher in mathematics and AI and since that he has spent more than 15 years in medical device engineering. He is the named inventor on many patents in retinal imaging and machine vision and has presented at over 50 conferences as well as being an invited speaker at TEDx Glasgow.